Summer is all about refreshing juices, picnics under the shade, bubbling fruit cocktails and of course, plenty of grilling. But wait, what about the damages that our skin will experience due to all these favourite food extravaganzas as the months turn from summer to winter? Research reveals that our skin is a mirror of our internal bodily health, for every single food item we consume and how it affects our body is manifested clear upon the surface of our skin. Individuals who devour heals of sugary treats, fatty foods and processed treats tend to experience a fast and premature aging process, as their collagen is broken down much more quickly, which causes their skin to lose all its radiance and glow. However, on the bright side, nature provides us countless foods and fruits that aid our skin and protect it from all kinds of weather conditions, be it excessively sunny or dryness-inducing cold, to retain our summertime freshness and glow all year-round. The idea is to pick out farm-fresh produce, fresh and ripe fruits, nutrient-packed veggies and healthy fats. At the same time, it is essential to cut down the consumption of sugar as it speeds up the aging process of the skin, triggering the emergence of too many wrinkles and causing the skin too look excessively dull. Also, be sure to cut down your alcohol consumption as it causes the very same skin damages as sugar. Sunscreen alone won’t be enough to preserve your youthfulness and beauty. Therefore, we’ve picked out 7 immensely healthy nutrient-packed foods that will give you a fresh and radiant glow all year-round. Papaya is an extremely common and effective skin-care ingredient, and it is found in most skincare products, be it a skin mask, facial scrub or exfoliator. However, nutritionists and skin care experts believe that in order to reap all its skin care benefits and a rich concentration of vitamin C, it is highly recommended to consume the fruit as well. 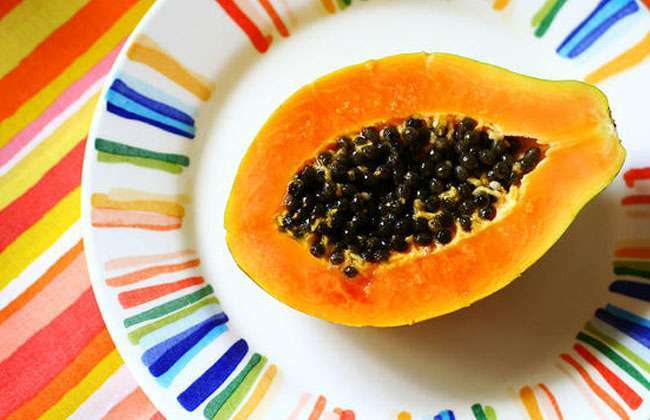 You see, it is loaded with powerful antioxidants and the best part is, papayas are available all year-round, primarily during the summer when our skin is most endangered by the harmful rays of the sun. This vitamin-C packed food will provide enhanced protection against the attacks of free radicals that tend to damage our skin cells, along with aid in repairing our skin tissues. Research reveals that vitamin C is an essential nutrient required for the production of collagen, which is basically a protein that provides our skin its elasticity and health.